Gulf States Construction Services performs construction services as a General Contractor under various forms of AIA contractual agreements. 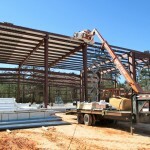 We are licensed in Louisiana as a Commercial and Residential General Contracting and Construction Management firm. GSCS provides Project Management, Development oversight and planning services to public, private and institutional owners of real estate. Such as the church picture above, and the $260,000,000 Louisiana Superdome renovations, post Hurricane Katrina.